With "Game of Thrones" drawing nearly 20 million viewers, it's no wonder people are clamoring to buy various props and replicas from the show. 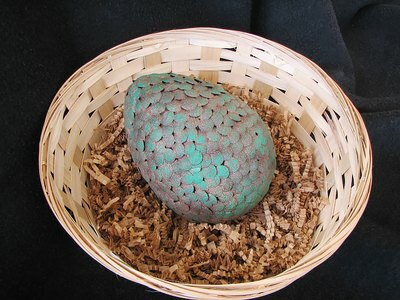 Perhaps the most coveted prop of all is the dragon egg. 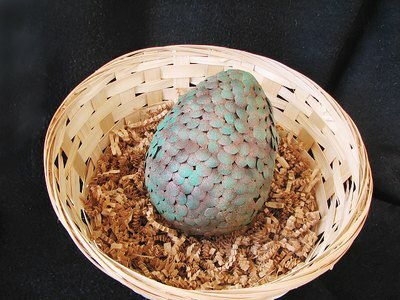 Surprisingly scale-like with a rusty patina finish that is straight out of Westeros, this easy do-it-yourself version will have you channeling your inner "Mother of Dragons" in no time. 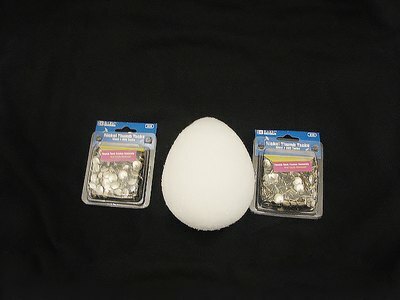 Begin sticking the thumbtacks at the bottom of your foam egg in a circular arrangement, overlapping each other. 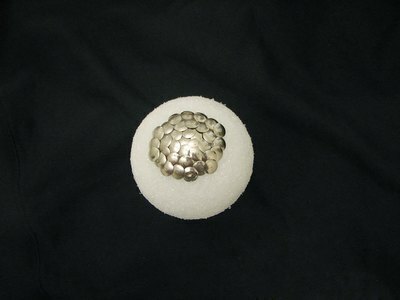 If a tack goes in too easily, place it in a slightly different spot to have a better foothold in the egg. 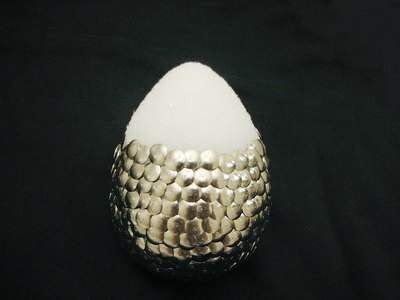 Continue inserting the thumbtacks around the middle section of the foam egg. Tip: Stick tacks straight in and not at an angle. Complete the top of the egg, overlapping the tacks as necessary. You could stop here and enjoy the egg as-is, or you could follow the next steps to create a rusty patina finish that will give the egg an ancient fossilized look. 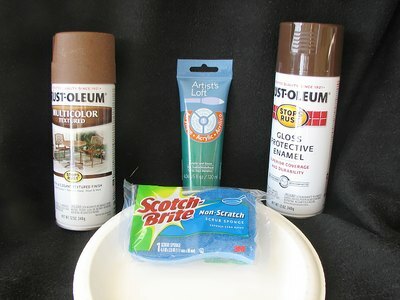 Note: When you specifically use the Leather Brown spray paint and the Rustic Umber Texture spray paint together, they chemically react to create a rusty texturized finish. However, you could also try using a rust-colored paint if you prefer. Place the fully tacked egg on top of a tarp. 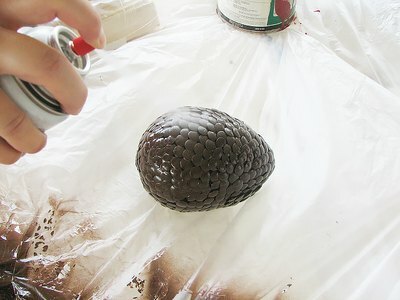 Use the Leather Brown spray paint and spray as much of the egg as possible on the side facing up. Wait until the paint is fully dry (so the tacks are not sticky and get pulled out), and then flip the egg over and spray the other side. Tip: Make sure to do this outdoors to ensure you have plenty of ventilation. Also, be sure to do this when it isn't windy outside, since the wind will carry the spray paint. 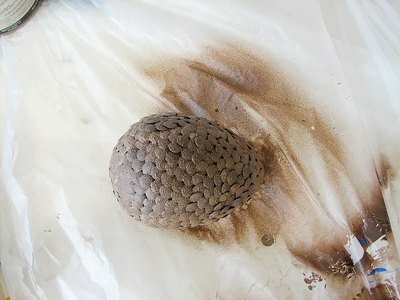 Once the leather brown paint is completely dry, it is time to spray the egg with the Rustic Umber Texture spray paint. 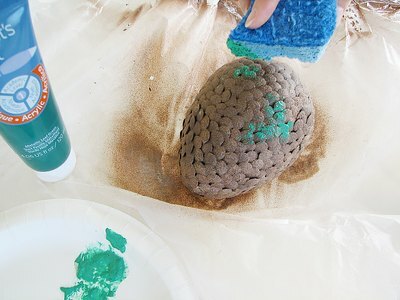 Spray a light coat on one side and wait for it to dry before flipping the egg and spraying the other side. 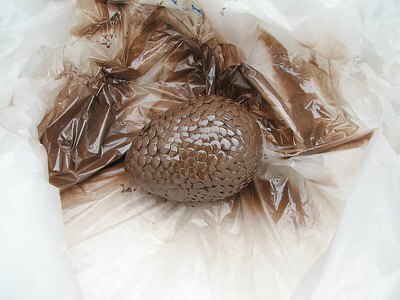 The Rustic Umber Texture spray paint will bubble up and react with the Leather Brown spray paint to give the egg a nice textured look and feel, as if it were an ancient dragon egg. Allow the texture paint to dry completely. Pour a little of the blue-green acrylic craft paint onto a palette or paper plate. At this point, you will want to put on the latex gloves and hold the egg while you paint. Dampen the sponge and lightly dip it in the paint, making sure you only have a thin layer of paint on the sponge. If you have too much paint on it, you may lose the texture finish applied in the previous step. Gently dab parts of the egg to mimic the look of blue-green verdigris that is characteristic of patina. 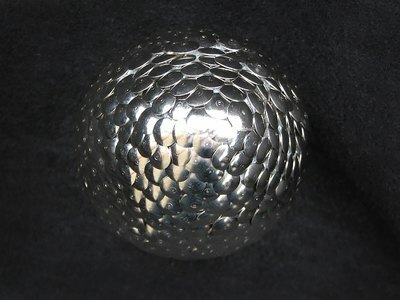 Display your finished dragon egg. Try it out on the mantel or a bookshelf. You could set it on a pedestal, a basket, a bed of straw, a pile of sticks or any way that lets everyone know "winter is coming."